Our youth are an important presence in the ministries of St. Peter’s, and we are pleased that we can provide a safe place for them to simply be the awesome person that God created them to be. We hope to see them at one of our many events! Our Youth Group is open to any youth in grades 5 through 12. We have monthly all-youth events featuring dinner and fellowship. The nights are filled with good conversation, fun games and lots of food. 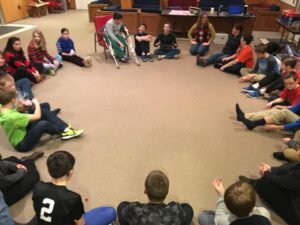 Throughout the year, the youth are invited to participate in retreats ranging from winter retreats for middle school and high school to summer beach retreats and Confirmation Camp. During the year we have events specifically designed for our junior and senior high youth. Our Youth Council helps direct the activities of the youth. The youth council president likes all youth to gather and brainstorm ideas for youth fun, activities and projects. All youth are welcomed to meet for these sessions. Youth Sunday School focuses on providing Christian education for grades 5 through 12. Find out how our youth deepen their faith.